Christmas is a truly a magical time of the year as we get to spend so much more time seeing our friends and families compared to any other celebrations throughout the year. We love to mix things up and have worked hard to create a few new Christmas flowers for our customers that you can send to loved ones. Our new Christmas floral arrangements will transform any space and add that festive atmosphere. Ideal as Christmas present and centrepieces, Bloom Magic will take the hassle out of sending presents with our next day Christmas flower delivery across Ireland. Let’s have a look at some of our favourite Christmas bouquets that we have on offer this year. We all know that the most important Christmas plant is the pine tree, which is why this year Bloom Magic has decided to bring you our own mini tree. It is amazingly festive in so many ways! First of all, it is a real rooted tree. Second of all, it fits through a letterbox, making delivery a piece of cake. Once received, you will be able to set up the Mini Christmas tree in no time, and when the Christmas is over, you will not have to worry about where to recycle it! Simply keep it in a pot or plant it in your garden. This floral setup is great visual and spiritual refreshment filled with snowy whites and cute greens. It is a great choice to brighten up any room, even if there is barely any snow outside. With subtle decorations, like silver accents, the Prancer bouquet is an elegant and understated choice – ideal for those people who like something a little more neutral than bright red. Red roses and green fillers is a popular Christmas combination and is a true classic. We have loved designing our Rudolph bouquet for exactly this reason. It will suit any Christmas décor with its radiant red and green colour scheme. 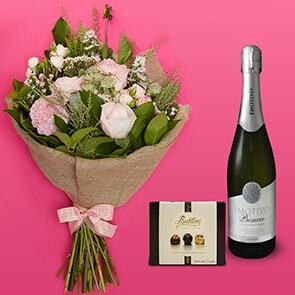 The bouquet will include a variety of festive finishing touches, such as dried fruit and pine cones. This Christmas floral arrangement looks as beautiful as it sounds. Strong contrast between the white hatbox and the saturated reds makes our Le Pere Noel hatbox the classiest choice on this list. 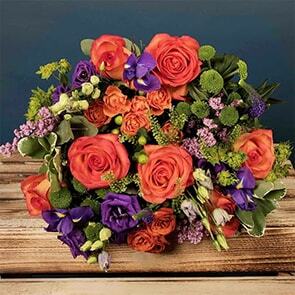 Not only does it make an ideal gift for your significant other, your mother or mother-in-law is guaranteed to enjoy this gorgeous arrangement. The Dasher is one of the brightest bouquets radiating those soft colours that will easily match any room or office. It is a true attention grabber and what’s more, it is delivered in a handy letterbox, just like our Mini Christmas Tree. It includes silver and gold spray painted leaves, for an understated and elegant touch. 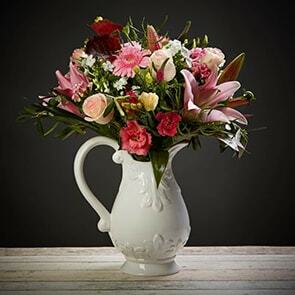 Display in a brightly coloured or glass vase to show off its true beauty. Bloom Magic offers the highest quality flowers put together by our designers, so visual satisfaction is guaranteed. With a great selection of Christmas flowers, order one for yourself or send a gift to your friends or family. Click here to view our entire Christmas collection and book your flower delivery today in time for Christmas.